Are you looking to gain killer triceps or boost your upper body strength? Looking for quality exercise equipment that you can add to your office or home gym? Do you need something that is portable enough to take with you when you are away from home? If you answered yes to any of these questions or are simply looking to expand your home gym a portable dip station is an excellent choice. Designed to give you an upper body workout, dip bars are an excellent ultra-mobile addition to any gym. Dip stations or stands can be used for so much more than just tricep dips. They offer a wide variety of exercises including pull ups. When it comes to dip stations, there are very basic ones and also complex ones. What you choose is really going to depend on your intentions. No matter if you choose a simple or complex piece of equipment, how effective it will be depends on what your fitness goals are. Best overall. Extremely versatile and easy to store away. 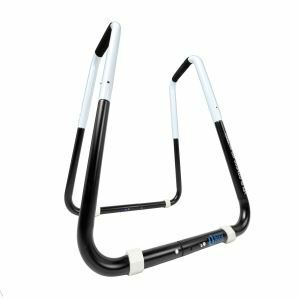 If you want exercise equipment that can almost do it all The Original Lebert Fitness Equalizer is an excellent home dip bar to choose. The Lebert Fitness Equalizer is two parallel bars that each measure 31 inches tall and are 25 inches wide. Each bar weighs a mere 8 pounds but can support up to 400 pounds of body weight. The lightweight equipment is easy to store, bars can be stacked together to take up the least amount of space. With the Lebert Fitness Equalizer portable bars, you have exercise equipment that is simple, but versatile to add to your home or office gym. With this, you have one piece of equipment that targets your arms, core, back, and chest. The Lebert Fitness Equalizer makes it easy to add more repetitions at a higher resistance without having to stop for adjustments. With this amazing piece of equipment, your own body is the resistance, no need to add anything else. Using your body as resistance ensures you get the right level workout. Plus you have full control over the amount of body weight being used for any exercise. The Lebert Equalizer dip bars can be used without a spotter even if you are pushing yourself past your comfort zone. Self-spotting, which uses the legs to stabilize yourself, allows you to push yourself past your limits. For those of you that are over 6 feet tall The Original Lebert Fitness Equalizer machine will not work for you, the 28 ½ inch height is too short. Instead, you will want to look into the XL Frank Medrano Equalizer. This gives you everything the Lebert Equalizer does but with a 31 ½ inch height. The Ultimate Body Press Dip Bar Fitness Station is an excellent choice and the best portable dip bar on our like. It is perfect for those who are looking to exercise from the home, office or even when they are on the go. One of the best features this product has to offer is the ability to lock when it’s folded flat. With this exclusive design, the Ultimate Body Press Dip Bar Fitness Station is easy to store at home or take with you when travel. The Ultimate Body Press Dip Bar Fitness Station offers an open frame with angled grips giving you the ability to perform a wide range of exercises. The steel tubing is 1.5” thick that can be adjusted two widths allowing people with larger builds to successfully use the equipment. The tricep Dip Bar has the ability to handle up to 350 lbs or people up to 6’5” tall. The Dip Bar Fitness Station is color coded for easy assembly and requires no tools. The leveling feet are fully adjustable, and the foam grips are high-density foam to ensure comfort for longer workouts. With the Dip Bar Fitness Station, you will be able to get the results you are after faster. An asymmetric design paired with angled grips is perfect for tricep and chest dips. 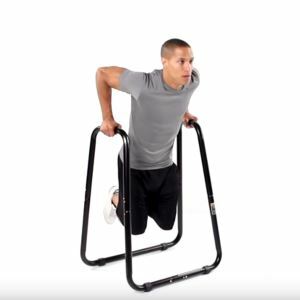 The Dip Bar Fitness Station can be used for compound bodyweight exercises, including bodyweight rows to balance chest, back, and shoulder development. You can even work on building your core strength with L-sits and knee raises. Controlling resistance to ensure a full intensity workout is done with dip exercise variation. For those that want to add a little bit more to their home workout, you can purchase a weighted dip belt and agility trainer separately. The Black Mountain Dip Station is a full steel product that is rated to hold up to 3,000 pounds. You would think with such a high weight rating that the dip bar itself would be on the heavy side. Although it is a heavy duty dip stand, it is very lightweight making it easy to transport from your home to your office or wherever you need to go. To add to its mobility, the dip stand is easy to put together. It will require a small, thin screwdriver for assembly. The Black Mountain Portable Dip Station measures 37 inches tall and is 22 inches wide. The unit itself is extremely sturdy and will not move when in use when going all out tricep dips. With the 37-inch height, people of all heights find it easy to use for regular and weighted dips. However, some people find the 22-inch width to be a little too broad. The foam hand grips provide support and comfort but can be taken off if you find they get in the way. To ensure the unit stays stable when in use the stand has four stabilizing feet to ensure it sits level on different surfaces. If you are looking to burn fat or even build lean muscle, the Black Mountain Dip Station is an excellent choice. The dip bar can be used for a variety of body building exercises, including knee raises, back row, dips, leg raises and so much more. 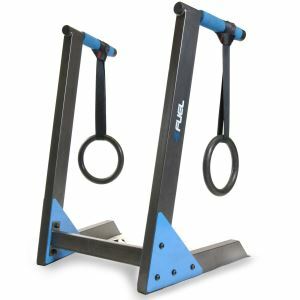 Hanging weights can be used in conjunction with the dip stand to add resistance and vary your workout, but weights and resistance bands must be purchased separately. The Fuel Pureformance Deluxe Dip Station is an excellent choice for those who wish to add quality equipment to their home or office gym. If you are a gymnast, these are the best portable dip bars for you. The Deluxe Parallel Dip Station is constructed from sturdy steel that has a nice powder coat finish. The heavy gauge steel is held together by solid steel bolts. The open pass design allows for the Deluxe Dip Stand to be used for a variety of exercises, including tricep dips and back rows. One concern people have with dip racks is the width of the parallel bars. The Deluxe Portable Dip Stand offers angled grips, so they are not the same width throughout. The narrowest point of the grips is 21.5 inches wide, while the widest part measures 24.5 inches. The width delivers excellent results even for people who are taller than 6 feet and ensures for ergonomically correct tricep dips. The padded hand grips are thick enough that you won’t have to worry about bruising, but will probably need to be replaced within two years. Unlike other parallel dip stands, the Fuel Pureformance Deluxe Dip Bar comes with a set of Olympic Rings. These rings can be used on the station itself for a variety of exercises. The rings can also be removed from the stand if you find they get in the way. Once removed, the rings can be used on different equipment, including pull-up stations to add variety to your workouts. The Titan Fitness HD Dip Station Stand Body Press offers a unique and durable design. 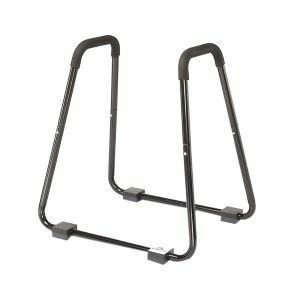 The equipment is built to last a lifetime as it offers a heavy duty steel frame with a powder coat finish. The single piece design of the HD Dip Station offers more stability than a two piece design. The extra wide base compared to other dip racks adds to the stability, ensuring it won’t tip or move when in use. The HD Dip Bar is 39 inches tall, 34.5 inches wide, and 31.35 inches long. The handles measure 20 inches wide with a 1.5-inch diameter. The foam handles offer an ergonomic design that allows for a comfortable and safe grip. The plastic feet along the bottom of the unit prevents the metal legs from scratching up your floor. The grips and plastic feet also provide stability and prevent the dip stand from slipping or moving while in use. 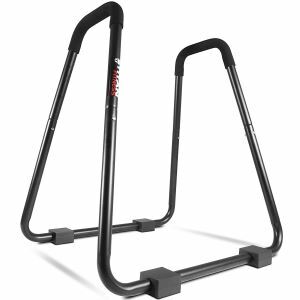 The Titan Fitness HD Dip Station is a versatile piece of exercise equipment. It has an exceptional weight capacity, can easily support up to 750 pounds. 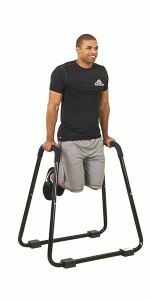 Its unique design allows it to be used for a variety of exercises, including dips, rows, planks, raised pushups, leg swings, and more. To add even more to your workout push up rings or straps can also be added. With a portable dip station, you are going to be able to save a ton of money every year. Owning a dip bar means you can finally give up that gym membership and machines you have been paying for every month. No gym membership is needed because of how versatile the dip bars are. You can do almost every key exercise you perform in the gym with dip bars at home. For more resistance or added intensity, you can add weight belts or resistance bands. With dip stands, your body weight provides the resistance, so the more weight you add the higher the resistance. A number of great ab exercise can be performed on dips bars too making them a great alternative to electronic ab belts. Another benefit to portable dip stands is they are lower than other dip stands. The lower height makes these an excellent choice for shorter people who struggle to use wall mounted dip stations or other similar equipment. Even better is the lower height doesn’t impede the effectiveness of the equipment, taller people can use them just as easily as the shorter people. Not to mention most people bend their knees when doing dips. The biggest disadvantage to portable dip bars is they are not as sturdy as wall mounted dip racks . The reason why they are not as sturdy is rather obvious; they are not mounted to a wall or anything else for that matter. Not being mounted increases the odds of the dip stand wobbling or sliding while in use. Stability is one of the most important factors to look into when choosing a portable dip bar for this very reason. The other disadvantage to portable dip stands is that some people might have to bend their knees when using the equipment. For many people out there this isn’t really any issue because they naturally bend their knees when they do dips, but for those who don’t it can be a problem. Some models require more knee bending than others. Pay attention to the dimensions and read other’s reviews to see if height is a problem. You can also look for portable dip stands geared to taller people. With so many products to choose from it can be nearly impossible to determine if you are choosing the right one. Before you make a decision on what portable dip bars to buy you will want to look at each product to see if it will work for you. One of the first things you need to look at with dip stations is its load rating. You want to make sure that the load rating is going to support your weight. Your top quality dip stations will most likely have a high enough load rating to support the heaviest users but always check before buying. This is also something to considier if you are going to be adding weights to exercises with a dip belt. Stability is important in portable dip stations. The last thing you want is a dip station that starts to slide or wobble as you are exercising. Instability leads to a higher risk of injury. When looking at the stability of the equipment you will need to look closely at the base. You want something that offers a solid base. If the equipment is a single piece look for a wider base as that provides more stability than narrow bases. You will also want to look for bases that have stabilizers on the bottom to allow the unit to sit level on a variety of surfaces. Adjustable stabilizers are the best, but any kind is better than none. You will also want to look for a durable dip station. You want to find one that offers a heavy duty steel frame. The heavier gauge used in the steel frame the more durable the equipment will be. The metal pieces need to have some kind of corrosion protection. Your top quality models will offer a powder coating designed to prevent rust and corrosion to ensure they last a lifetime. Dip stations might look simple, but they can be used for so many different exercises. Look for dip stations that allow you to add equipment, such as rings, weighted belts, resistance bands, etc. to ensure you get the most out of your new strength training routine. Even without the extra equipment dip stations can be used for exercises that target upper and lower body, as well as build your core strength. Being that you are purchasing a portable dip station, you want something that is actually portable. You want something that offers a lightweight design in conjunction with a heavy-duty frame for durability. The lightweight design allows for you to easily take the dip stand with you when you travel. Portability is really important for people who never workout in the same place. If you have a home gym setup storing the equipment isn’t going to be hard. Dedicated home gyms allow you to assemble the equipment and leave it in one place. If you don’t have a home gym or plan to use the dip station in your office you need something that you can store. Some dip stands offer better storage than others. You can look for dip stations that fold up for easy storage. Others will allow for stacking to help save space. What you look for will depend on the storage space you have for the equipment you are purchasing. Conclusion – What Is The Best Dip Bar? Portable dip stations are an excellent piece of equipment to add to your home or office gym. Smaller than ordinary dip stands, portable dip bars don’t require much space to use or to store. Their lightweight design allows them to be used for people who exercise on the go. When purchasing a portable dip station you want to make sure you pick a top quality product, such as one of the five portable dip bars we reviewed here. Your best portable dip stations are going to offer stability, durability, and portability. Your top quality dip stations are going to have a high load rating, the higher the load rating, the more people who can use it. Versatility is also something that is going to be offered by top quality manufacturers. Portable dip stations allow for a variety of key exercises, but will also have the ability to add extra equipment to increase the intensity and resistance of the workout. Now that you know what you are looking for go on out and purchase one today.